Current: How do I help my kids start social...How do I help my kids start social media—without losing my mind? When is the right time to let my kids join social media platforms? What does too much—or too little—monitoring look like? What’s the line between being in the dark and being creepy or controlling? How can we help our kids become social media users without losing our minds? Because I parent a 13-year-old every day (plus her older and younger siblings), I think about questions like this pretty regularly. Even though we made both of our older kids reach the thirteen threshold before diving in (here’s why), and even though she can only post from home or on Wi-Fi (because she’s apparently the “only” 13-year-old on earth without a smartphone, though the actual percentages fluctuate a lot depending on who’s counting), it doesn’t really reduce parental anxiety over what is—or could be—happening not only “out there” online, but also inside as she navigates her own identity formation. Like me, you might be thinking about your parenting options in light of this anxiety. We can lock them down and keep them isolated from the evils of social media—and consequently isolate them from most of their friends—or we can take a deep breath, put some scaffolding in place, and go along for the ride. Research is far from authoritative on these matters yet (the phenomena are still too new and continually evolving), but current indicators paint a picture of social media as the new “school lunchroom” of adolescence. 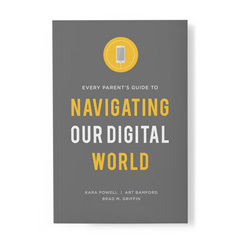 In Every Parent's Guide to Navigating Our Digital World we explore this idea in more depth, but in a snapshot, a quick glance through social media serves much the same function as a glance around the school cafeteria, complete with all the social cues and nuances of evolving adolescent identity formation. In other words, this stuff matters to our kids a lot precisely because it’s one of the environments in which they’re playing out their quest to answer the big questions of “Who am I?” and “Where do I belong?” Just like young people have always done. But knowing that doesn’t make it any less unnerving for parents. Especially when CNN reports that some 13-year-olds check social media 100 times a day. Or Common Sense Media research finds that nearly 60 percent of teenagers say social media often distracts them from doing homework. And then experts like Sherry Turkle remind us that our devices and digital media have a way of impeding the face-to-face conversations necessary for building basic life skills like empathy, self-restraint, and emotional intimacy. Rather than villainize the modalities of teenage connection, we can capture these parenting quandaries as opportunities to learn. Let’s not miss this incredible chance to coach, mentor, and journey with our kids into the world of digital media. Because if we don’t, someone else—or the mob of teen culture, or the pull of brand marketing—will pick up where we leave off. 1. Start on one platform. Easy does it. While your kid might want to explore Snapchat, Houseparty, Instagram, and Facebook (to hang out with Grandma) all at once, that’s likely to be overwhelming for all of you. Start with one account on one platform, and you (the parent) get to hold the password to that account and have access to the device on which it’s used. If you’re not already using the platform yourself, get your own account too. Avoid anonymous-posting platforms (like ASKfm) that can facilitate bullying or predatory behavior. 2. Go over online safety rules. Then do it again. Do you remember the first time you taught your kids about the importance of wearing bike helmets? Neither do I. Why? Because we’ve had to ask over and over and over again that they put the darn things on. And each time we have to remind them why. As our pediatrician once told my 7-year-old (who had confessed to wearing a helmet “sometimes”), we only get one brain, and when it breaks, it doesn’t get better very quickly. But kids don’t really care about this kind of future-talk. They can’t predict what life with a traumatic brain injury might look like. So they glaze over during our lecture, then shrug it off and do what’s easier, more comfortable, or more fun in the moment. Online safety is a lot like bike safety. You don’t think about it much until something happens. Before my daughter and I set up a first account, I talked through the importance of only accepting “follow” invitations from people you know. We talked about creepy men who pose as kids or as harmless fan accounts for popular artists. We talked about social media being an extension of relationships you have in real life. She nodded and agreed. Then a month later we had the same conversation. And a month later I scrolled through her followers to find some accounts that freaked me out a little, and we had another conversation. It’s not that my daughter is a rebel. It’s just sort of like the bike helmet. BONUS: Use this free download as a quick reference tool to develop digital protocols in your family. 3. Watch, but don’t stalk. Recent research suggests that teenagers who know their parents are monitoring their social media interactions tend to be less distressed by online conflict. Having your support—and at times your help—as a safety net can be somewhat of a relief to young teens, even if they may roll their eyes at you about it in person. But try to restrain yourself from lurking every day at every move they make, and refrain from mentioning in person everything you see online. Especially as they get older. 4. Remind them “likes” aren’t everything. Then model it. But on social media, liking “likes” can have a dark side. One study of 13-year-olds found that they get anxious about what’s happening on their social networks when they’re not looking: 61% want to see if their posts are getting likes and comments, 36% want to see if their friends are doing things without them, and 21% want to make sure no one is saying mean things about them. In other words, the biggest motivation for posting and checking back in is to see how others are responding to what they have to say and show. For the vast majority of teenagers, these interactions are primarily with peers they know in real life, so a digital reaction is an extension of what happens—or doesn’t happen—in the lunchroom or on the soccer field. Talk with your teenager about the ways that seeking digital reactions can drive us too much, then follow up that talk by modeling it yourself. After all, many adults compulsively check in for similar reasons. 5. Interact on their terms. Prepare for the terms to change at any time. At thirteen or younger, friending and following your kids is important. But keep the interaction with them about what they’re doing online offline unless you’re invited in. Among parents we’ve interviewed, the majority say they don’t like, tag, or post on their kids’ platforms, but if their kids tag, post, or interact with them online they reciprocate. It’s a bit of a dance, and the song can change midway across the floor. The other night my daughter and I were looking at something together on social media on my phone, and she said, “Why didn’t you like that picture?” I explained that I was trying to give her space and not like or comment on her posts, and she promptly grabbed my phone and liked her own post. This week she doesn’t mind her friends seeing that I’m associated with her. Next week might be a different story. Flex and keep dancing. It’s not really about you. BONUS: Tap into trusted adults. One of the first things my daughter did after creating an Instagram account was scroll through my feed and follow a number of adult friends, many of them from church—adults who know her and who were happy to follow her back. Though sometimes I wince a little when someone mentions one of my kids’ social media feeds on a Sunday morning, truthfully there’s also some relief in knowing that I don’t have to be the only adult tracking what kinds of interactions are taking place on social media. Other adults they trust and who can be places of honesty and grace (both digitally and face-to-face) are part of this journey too. And even if later they abandon this adult-saturated platform for something more peer-focused (as older teens tend to do), they’re starting out with a support network in place. If you have a young social media user in your life, how are you keeping your sanity?